Yes, My Friends and I Want to Exercise and Eat Right, but Technology Could Really Help Us! We Have Some Ideas......Are You Ready to Listen? 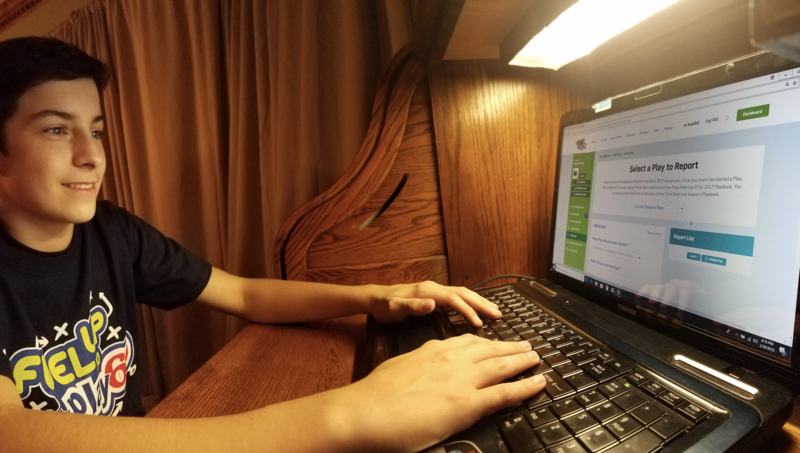 13-year-old Brody Canning of Chesapeake, Virginia visits the Fuel Up to Play 60 (FUTP 60) website to access challenges and activities to improve healthy eating and physical activity in his school. The Fuel Up to Play 60 program is made possible by the National Football League, National Dairy Council and America’s dairy farmers and GENYOUth. If you are reading this, and happen to develop or promote health technology products, you’re missing out on a big opportunity: me! Not to mention my friends in middle and high school. Why am I saying this? Because like most kids my age, I use technology a lot and am always trying to find new apps and devices that can motivate me to exercise more and help me eat better. My name is Brody Canning, I am 13 and currently in the eighth grade. I volunteer at my middle school in Virginia as a National Student Ambassador for Fuel Up to Play 60, which is a great program for not only learning how to eat better, but also exercising more while at school and when you have free time. I care a whole lot about my health and wanting to feel energized each day, so I wish there were more products that understood me, and my friends. As you probably know, people my age are pretty good with technology, and we use it all the time. While I feel like that is not a bad thing, I know that sometimes my parents and other adults feel like we spend too much time on our computers and cell phones. Some adults probably wish they could somehow get rid of technology and take us back to the days when kids played outside from sunrise to sunset. We all know that’s never going to happen, so why not try to embrace technology and use it for good? A few months ago, I participated in the GENYOUth and Thrive Global Inaugural Youth Survey on Trends in Health and Wellness, and it really opened my eyes to what kids my age are thinking. The results of the survey found that only 29 percent of kids use technology and apps to enhance their well-being versus 67% who use it to enhance their social lives. When the researchers dug a little deeper, it turned out that just 11 percent of kids were actually using technology effectively as a part of their health and wellness routines. In case you were wondering, I happen to be part of the 11 percent. I hold myself accountable by participating in the Fuel Up to Play 60 program at my school, encouraging others in my school to get involved in making smarter nutrition choices and getting active for at least 60 minutes each day, and frequently visiting the Fuel Up to Play 60 (FUTP 60) website to access challenges and activities to improve healthy eating and physical activity. I find that most of the other apps and programs available just aren’t interesting enough to make me want to use them. What do I mean by that? I mean these products just aren’t kid-friendly. It’s not that the current technology options are too complicated for us to use, they’re just not made for kids. A lot of companies, like laptop and smartwatch developers, offer a toned-down version of a product for youth customers. Unfortunately, you don’t see that very often in the physical fitness realm. This makes me wonder – with so many kids using technology, why don’t companies try harder to connect with my generation and make products that kids want to use? When I’m using technology for entertainment and social purposes, I prefer Instagram to stay updated on different sports teams and check in with my friends. My friends also use sites like Facebook and Twitter for the same reasons. Fitness technology could become more attractive to people my age by taking a few pointers from social media. On these sites, users are rewarded with “likes” and more followers when they’re really active. If health and fitness companies took more of social approach that made kids feel good about their accomplishments while also having some healthy competition with friends, I believe my generation would use their products all the time. Since most of the health and wellness tech options are currently made with adults in mind, it leaves many kids searching online and going to sites like YouTube for health information. This is not good. Most of the videos on YouTube are not fact checked, so we don’t have credible sources to find information on eating healthier, working out and living a healthier life. I can tell you from hanging out with my friends every day that we feel responsible for our health for lots of reasons. Whether it’s getting in shape to play sports or wanting to look and feel our best, we are open to using any technology devices that can help us reach our personal goals. With that being said, I have some advice for developers, marketers, schools and parents on how to best understand middle and high school students. Developers and manufacturers should bring kids into the planning process. We would tell them that technology made for kids needs to be as cheap as possible because we don’t have a lot of money laying around to spend on expensive products. If we could buy some of these items, it would need to be durable and have simple instructions. We don’t need a hundred different settings… we just want something to help us challenge ourselves! Marketers should advertise the benefits that kids can receive from these products. If you need help, bring us into the boardroom to help you brainstorm and come up with good ways to reach people our age. Show kids using the products in TV commercials and quote us in advertisements. The more involvement from kids, the better it will be. Schools need to stop avoiding the topic – technology isn’t going anywhere anytime soon! Embrace it and teach kids how it can be used for good. Show us the path to using it to better ourselves. Parents can try to make the best out of the technology boom. Yes, it can be a bit overwhelming and yes, we should play outside more, but technology is a major part of our lives now. Please try to understand that and remind us how we can use it to live a healthier life. We have a long way to go when it comes to getting kids my age to use technology to improve our health and daily activities. But if enough companies listen, there’s a massive market of young customers like me, ready and willing to use their products. 13-year-old, Brody Canning, attends the 8th grade at Hickory Middle School in Chesapeake, Virginia and was part of the student focus groups that GENYOUth and Thrive Global commissioned in advance of GENYOUth’s Inaugural Youth Survey on Trends in Health and Wellness. Brody is a longtime participant in GENYOUth’s flagship physical activity and healthy eating program, Fuel Up to Play 60, and loves playing sports.